U.S. presidents often get too much credit for how the stock market does during their tenures while Federal Reserve policies actually have a more direct impact. 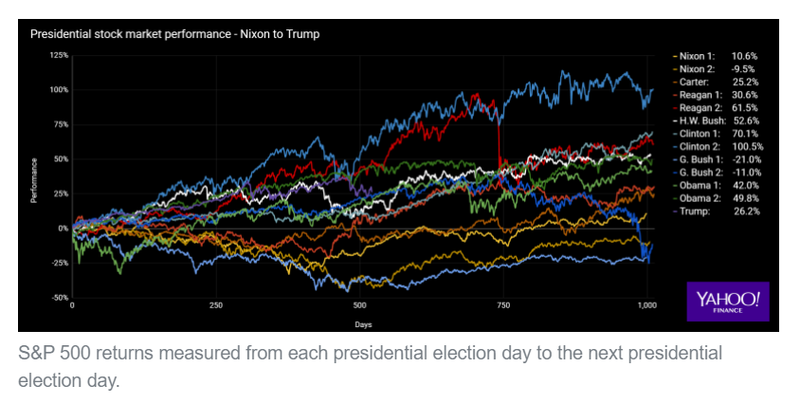 Nevertheless, Yahoo Finance took a brief look at how the market has performed under each president from Richard Nixon all the way to Donald Trump (through his first two 521 days in office), while also considering some of the major things that impacted the market. A presidential election oftentimes is a referendum on the state of the economy, which ultimately led to the downfall of George H.W. Bush, who failed to win a second term in office even though the S&P 500 saw a 52.6 percent gain under him, a strong number compared to Ronald Reagan’s returns of 30.6 and 61.5 percent first- and second-term figures, respectively. The stock market soared under Bush, but the economy fell into a mild recession he was unable to overcome in the election against a charismatic young Bill Clinton who, much like Trump’s “Make America Great Again” campaign, had a marketing slogan that struck a chord with voters. President Bill Clinton was the biggest winner in the Greenspan era, racking up returns of 70.1% and 100.5% in his two terms. President George W. Bush inherited the dot-com bubble bust, and racked up a loss of 21.0% in his first term. But a recovery was underway, quite literally built on housing. Most of us remember how that ended.